Sisters from left: Emelia Agana Ayambire and Esther Peter Bassey. 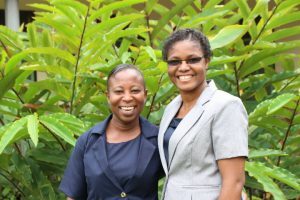 School Sisters of Notre Dame work in five African countries: Gambia, Sierra Leone, Ghana, Nigeria and Kenya. Our primary ministry is education. Most of our ministries are in formal education, but we believe that we are educators in all that we do. This includes chaplaincy in hospitals, nursing, religious education and social work. Please consider sending a financial gift to the Province of Africa.